We've Won TripExpert's 'Expert Choice' Award! With praise from sources like Time Out and Lonely Planet, we are one of the highest rated restaurants in Edinburgh on TripExpert.com. The award reflects the views of journalists and professional travel writers and is only bestowed on the best restaurants around the world. Time Out "The taste of Naples in the Scottish capital." Lonely Planet: "This bustling family bistro, loud with the buzz of conversation and the clink of glasses and cutlery, is no ordinary Italian but a little corner of Naples complete with hearty Neapolitan home cooking." The New York City based guide uses a unique rating approach that takes into account professional reviews from travel guides, magazines, newspapers and other respected sources. Less than 2% of all restaurants worldwide receive the award! We're very proud of our neighbourhood, family restaurant, and we look forward to welcoming you soon! We look forward to welcoming you this festive season at Locanda! We'll be serving our usual menu of regularly changing dishes made using fresh, seasonal ingredients with a few amazing traditional Italian Christmas dishes included for you to try. Please don't book expecting turkey and Christmas pudding! For parties of 8 or more, we will only be serving our sharing menu and it's essential that you book this in advance so we can discuss your preferences. Christmas Eve - last sitting is 7.45pm with orders to be taken by 8pm. The kitchen will close at 10pm with guests kindly requested to leave by 10.30pm. Hogmanay - last sitting is 7.45pm with orders to be taken by 8pm. The kitchen will close at 10pm with guests kindly requested to leave by 10.30pm. Carlo Petrini, President of Slow Food and Terra Madre, launches an appeal to support the people affected by the earthquake in Amatrice and to keep them in our thoughts, from today and in the future. we at Locanda de Gusti , On Monday 5th of September donate all proceeds along with staff salary to this cause . We are very proud to announce that we raised £2,568.00 on the night along with kind donations ,from diners that were unable to attend . Thank you to all who came ! Rosario was joined in the kitchen recently by Foodioso. Watch as he makes fresh rough-cut pasta and serves it with a sauce of garlic, olive oil, white wine, cherry tomatoes, courgettes and Scottish clams, finished off with freshly-grated bottarga . Delizioso! If you love a night at the movies followed by a great meal, this is the competition for you! We have 2 tickets to the UK premiere of Meg Ryan's elegant and moving World War II film Ithaca screening at the 70th Edinburgh International Film Festival on Thursday 23rd June. After the film, join us for an authentically Neapolitan dinner at Locanda. The perfect night out we'd say. This impressively staged and beautifully shot (at times it feels like a moving Norman Rockwell painting) adaptation of William Saroyan’s novel The Human Comedy marks Meg Ryan’s directorial debut. 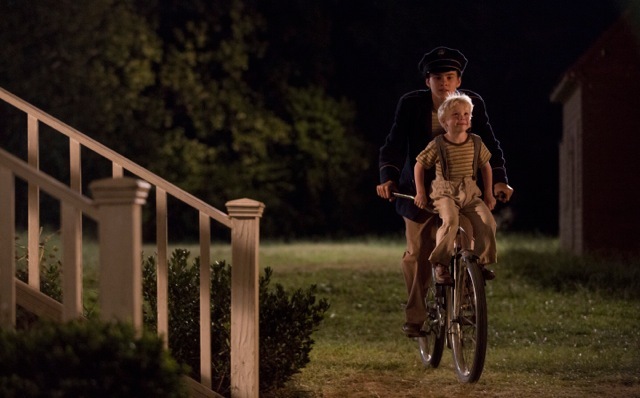 Its coming-of-age story follows 14 year-old Homer (Alex Neustaedter) as he starts delivering telegrams in the early 1940s, with his breezy life changing as he has to start delivering bad news. Tom Hanks and Sam Shepard contribute telling cameos. Established in 1947, the Edinburgh International Film Festival is world renowned for discovering and promoting the very best in international cinema - and for heralding and debating changes in global filmmaking. Intimate in its scale, ambitious in its scope, and fuelled by pure passion for cinema in all its manifestations, EIFF seeks to spotlight the most exciting and innovative new film talent, in a setting steeped in history. This year's Festival runs from 15th – 26th June. For more information please visit edfilmfest.org.uk. To be in with a chance of winning this superb prize, please email locandadegusti@gmail.com before midnight on Tuesday 21st June. Include your name, email address and telephone number in the email, and please ensure you state 'EIFF competition' in the email subject header. Terms & conditions: This prize is non-transferable and must be taken on Thursday 23 June; the film begins at 6.25pm at Filmhouse Lothian Road; dinner afterwards at Locanda de Gusti includes a bottle of house wine - all other drinks will be charged; the prize is for 2 people. By entering this competition you are agreeing to receive future newsletter emails from Locanda de Gusti. Join us for a fabulous evening of Italian food and wine on Wednesday 27th April. Rosario will prepare a 5-course sharing menu, each course carefully paired with wine from the Venegazzù Estate in the north of Italy. The evening will be hosted by the estate's owner and passionate producer Lorenzo Palla. Lorenzo was born and grew up on the estate, taking over the vineyard from his father in 1998, and will share with us his depth of knowledge on these wonderful wines. Wednesday 27th April at Locanda de Gusti. 7pm arrival for 7.30pm start. £48 per person (includes one glass of wine per course). Please call us on 0131 346 8800 or email on locandadegusti@gmail.com to book. What better way to spend a Sunday than eating amazing food, and it's even better when you see how it's made! 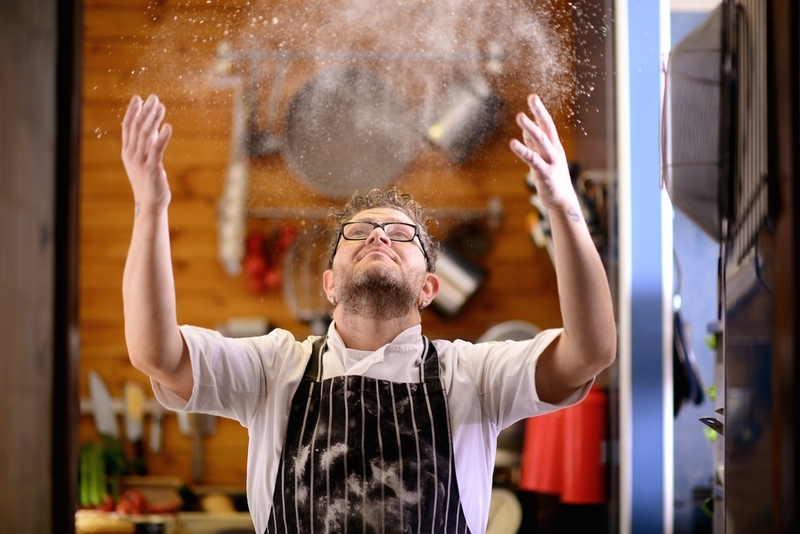 Join us at Locanda on Sunday 1st May to watch Rosario demonstrate how to make the courses you will then enjoy for lunch. 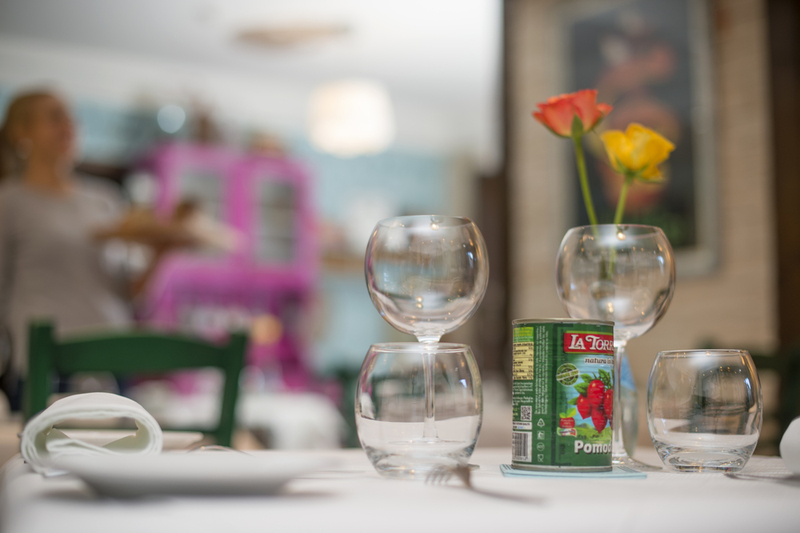 Everyone will then be seated together and lunch will be served sharing style - just like we do in Italy! The event begins at 11.30am and will finish around 4pm, and costs £35 per person (no drinks included). Fillets of lemon sole stuffed with fresh ricotta, chives and lemon served on a bed of zucchini scapece. Call 0131 346 8800 or email locandadegusti@gmail.com to reserve your place. Our Italian Sunday Lunch Raised £2100! Katy Sandford from The Edinburgh Sick Kids Friends Foundation with Raffaele, Rosario, Maria and Elena. 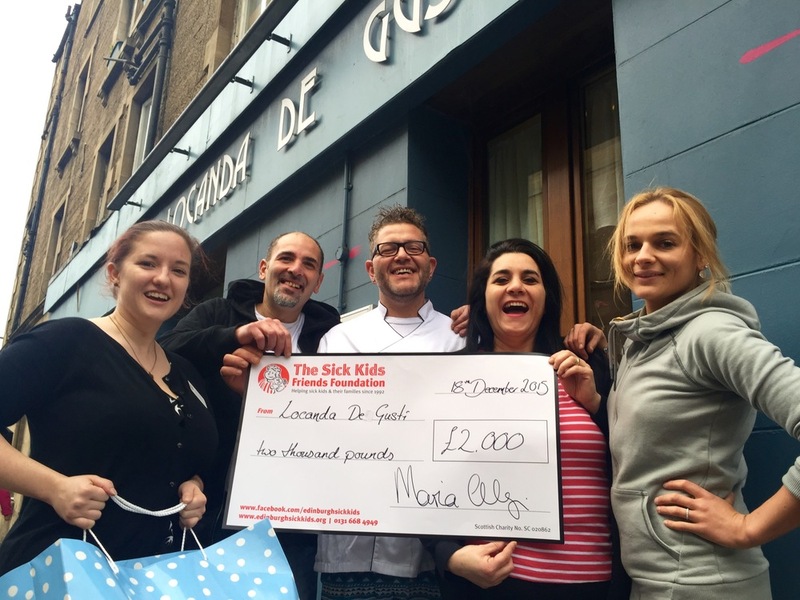 We hosted a fantastic fundraising Italian Sunday lunch earlier this month, raising £2100 for The Edinburgh Sick Kids Friends Foundation. Thanks to everyone who came and gave so generously for the raffle - and also for our guest who bid for Rosario to cook at his home! Today the Locanda team presented a cheque to Katy from the Sick Kids Foundation for £2000, and a sack of small toys which Maria bought with the other £100. If you can't make it to our Italian Sunday feast - you can still help us to raise money for Edinburgh Sick Kids by donating on our JustGiving page! We're delighted to give away 2 tickets to the Opening Night Gala of the 69th Edinburgh International Film Festival on Wednesday 17th June. 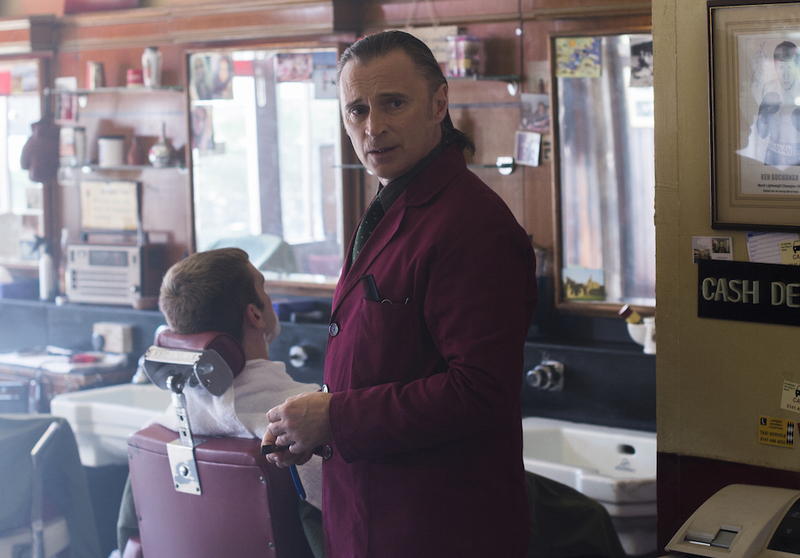 This black-tie evening begins with a world premiere screening of The Legend of Barney Thomson starring Robert Carlyle, Emma Thompson, Ray Winstone and Tom Courtenay at Edinburgh's Festival Theatre (6pm) followed by the EIFF Opening Night Party at the National Museum of Scotland on Chambers Street (8pm). Established in 1947, the Edinburgh International Film Festival is world renowned for discovering and promoting the very best in international cinema - and for heralding and debating changes in global filmmaking. Intimate in its scale, ambitious in its scope, and fuelled by pure passion for cinema in all its manifestations, EIFF seeks to spotlight the most exciting and innovative new film talent, in a setting steeped in history. This year's festival runs from the 17th to the 28th June. find out more here. To be in with a chance of winning this amazing prize, please email locandadegusti@gmail.com before midnight on Friday 12th June. Include your name, email address and telephone number in the email, and please ensure you state 'EIFF competition' in the email subject header. Terms & conditions: This prize is non-transferable. Admission to persons over 18 only.